Perfect for carnival parties and school fairs! Toss the balls and try to land it in the fishbowl. Great fun for the entire family! 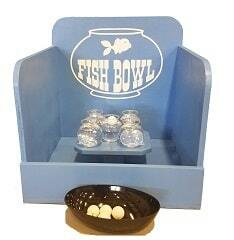 Game includes 5 fishbowls and 10 balls. Does not include water, fish or prizes.